EVEN KIDS who have never been around horses love these gentle animals, say the young campers. Enterprise Farms has offered a safe, fun-filled camp in the heart of Los Angeles (on the edge of Griffith Park and the Los Angeles River) for more than 20 years. The camp is for riders of all (even non-) experienced levels, says Gene Gilbert, camp manager. Campers learn grooming, horsemanship and riding. A demonstration is held most Fridays for family and friends so students may show what they have learned. The horses at Enterprise Farms are all gentle and well-trained, attest the young students. 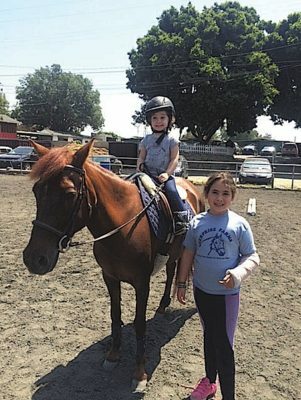 “Enterprise Farms is the very best horse camp!,” says Alyssa, 9. They “do a lot of other cool stuff, too, like crafts and nature hikes,” she says. The instructors are experienced and patient, adds Gilbert. Camp sessions are weekly; many campers come for several weeks. Stand-alone days are sometimes available “We offer camp year-round but are busiest when campers are out of school (holidays, spring, summer),” Gilbert concluded.